We’ve all felt it, holding a fistful of dice, seeing the possibilities across the board, prepared to conquer our opponents. This feeling of hope, endless possibility, unlimited power reaches a tipping point as we blow on the dice for good luck, get a tingle in our spine, and feel the electricity. We roll the dice, only to find three ones, a two, and a four, causing us to lose the game. Or maybe I’ve just felt that and you can’t stand dice. Maybe you understand that dice are the ultimate source of randomness in a game. But to me, they can also be an amazing source of potential. Classically, games have been broken down into two major categories: euro games and thematic games. One of the general distinctions in how games are divided is how they handle randomness and, commonly, whether dice are involved. In many thematic games, dice are used to simulate that events, even when you have the biggest advantage, are not necessarily going to go in your favor. For instance, in Twilight Imperium, you roll dice to deal damage to your opponent’s ships. On the other hand, euro games, with notable exceptions like A Feast for Odin, do not have “roll to resolve” mechanisms. 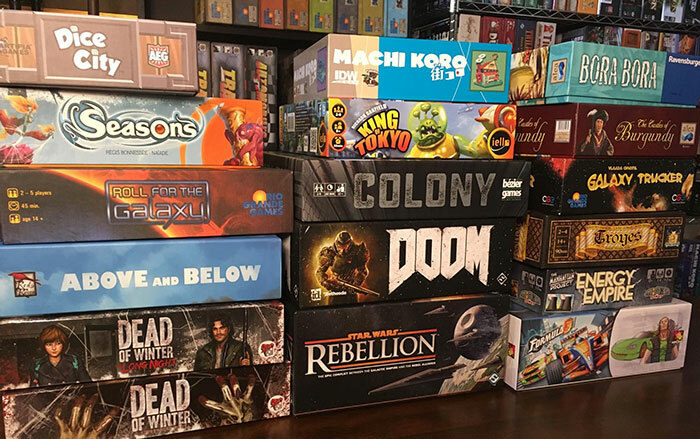 This isn’t Meeple Mountain’s first top 6 list about dice games. Previously, Andy Matthews released a Top 6 Dice Rolling Games list. In this list, Andy mentioned that “bad dice rolls can harsh your groove”, and can they ever! As a primarily euro gamer, one of my biggest pet peeves is when a game hands me a pile of dice, tells me to chuck them, and deal with the results. But there’s something so magical about that pile of dice, so much hope, so many aspirations for what might become. Fortunately, there is a renaissance in modern board gaming where game designers are getting clever with how they use dice. These games still attempt to follow euro trends with minimal luck involved, but give players the excitement of rolling a clutch of dice and hoping for the best. 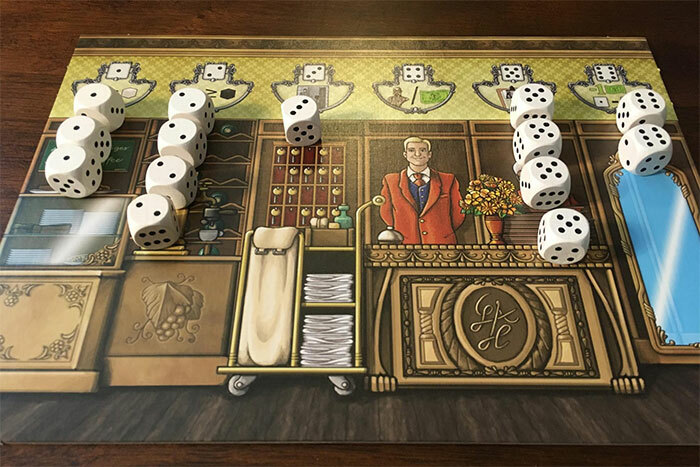 One thing that Grand Austria Hotel, and the next game on the list, has that makes it different than many dice games is there is a very limited sense of dice ownership. In Grand Austria Hotel the players are each managing a hotel full of hungry guests who are particular about what rooms they will or won’t stay in. Each round proceeds by the first player rolling a collection of dice and grouping them based on their pips. In turn, players then select one die from the collection available and they perform the action associated with the number of pips on the die once per die of that number available. These actions range from collecting resources, to gaining money, to hiring employees, to doing any other action at a slight cost. After each player has taken one die, this process repeats in reverse order. The dice drafting is very fun and tense, trying to assess what your opponents’ needs are and if there will be enough dice for you to perform the actions of you want. The tension of waiting for your opponents to select the dice they want and hoping the dice you need will come back around to you in the draft is both exciting and challenging. 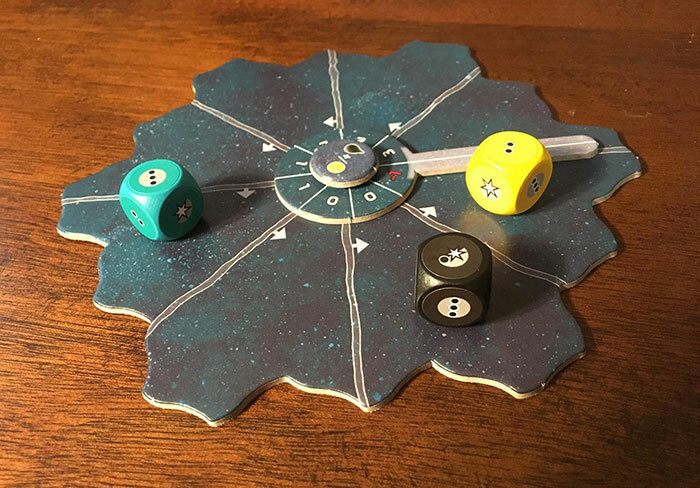 Likely the most obscure title on this list, Solarius Mission is a dice drafting/rondel pick-up and deliver/3X (explore, expand, exploit, but no exterminate) space game. The first thing that attracted me to this game was the 3X nature of the game, because the last thing I want in a board game is to vanquish my opponents and sit in fear of them wiping me out. I was pleasantly surprised to find an interesting and challenging dice drafting game on top of that. On your turn, players choose one of the dice available to them on the rondel. Depending on where the player selects the die from, they will either receive a bonus or have to pay gold and fuel. Based on the color of the die, they can either collect goods with that action or take the special action for that color. Black dice allow players to collect fuel for future space expeditions, brown dice increase the storage capacity players have, blue dice level up the player’s action potential which allows the player to take bonus actions when drafting a die with a star on it, and the yellow dice allow the player to collect gold. At the end of your turn, the dice you leave on the rondel become more valuable to the other players. Players use their resources to settle colonies, make space transactions, and build a space empire. Players have a fairly limited number of turns so they need to be efficient in collecting resources and improving their space ship. But beyond all of this, the place where Solarius Mission truly shines is in the improvements you make to your ship. As you are using dice for actions you can place them in special locations which get you a variety of bonuses. The tough decisions between choosing a die that directly benefits you or the high valued die of another color before your opponent snaps it up is a feeling only present in this game because of the dice action selection mechanism. Look out for a full review of this awesome game soon. 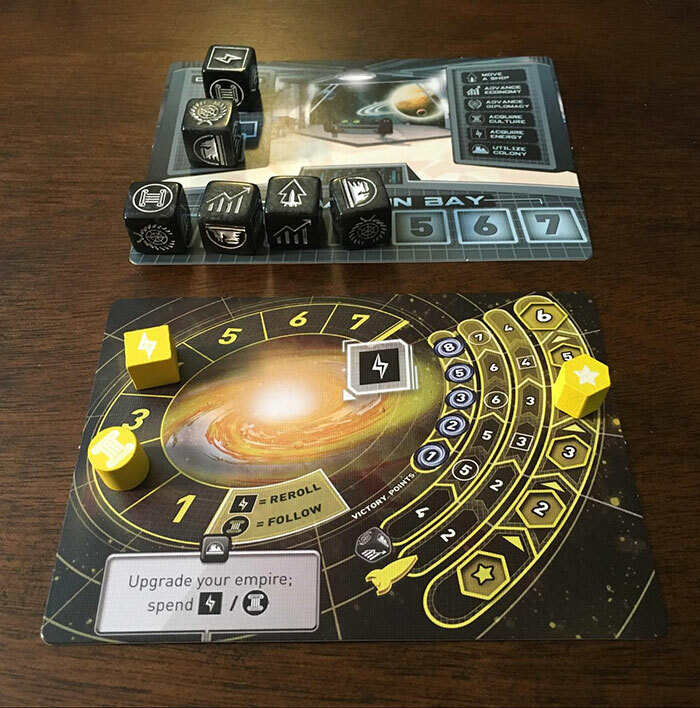 Roll for the Galaxy, or “Roll” is a reimplementation of classic, Race for the Galaxy. Roll is a game of action selection where each player starts with a pile of dice and will only collect more as the game progresses. 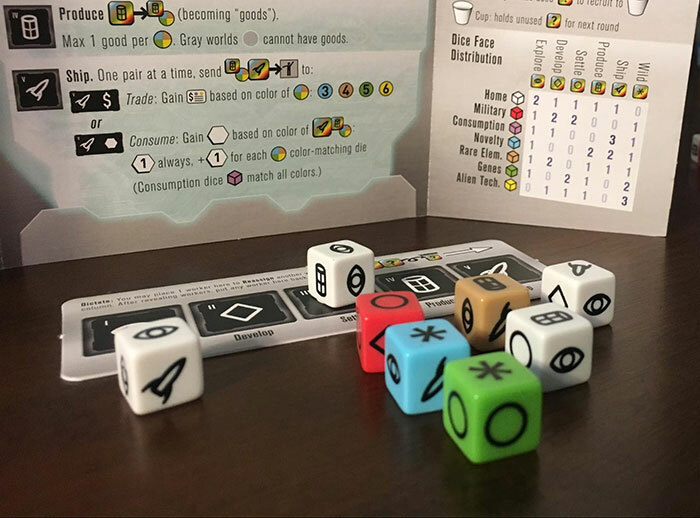 These dice have six different sides: exploring the universe, developing new technology, settling new planets, producing goods, trading goods you’ve produced, and a wild side which can be any action. On your turn you roll your dice and group them based on which sides are face up. Then you secretly pick one die, irrespective of which side is showing, and use that die to select which action you would like to do. Then, all players reveal which action they have chosen and all players take all of the actions selected by players once per die you have on that action. 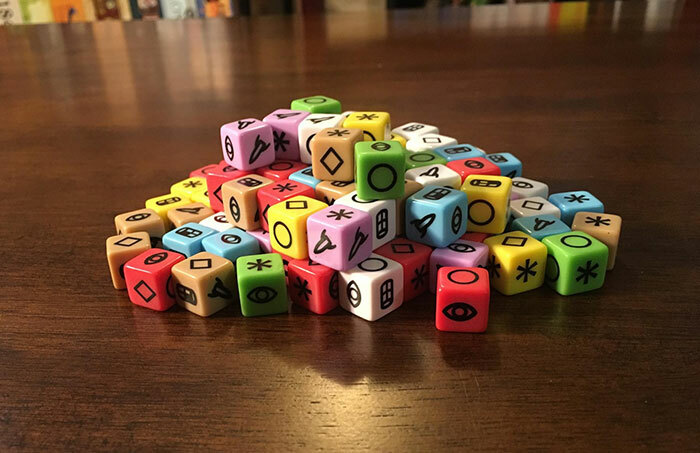 Over the course of the game, you’ll be gaining dice of different colors, and what makes these dice special is they all have different distributions. The white dice you start with have two exploration faces, one develop, one settle, one produce, and one trade. On the other hand, the yellow dice have three wild faces, one develop, one settle, and one produce. The red dice have one explore face, two develop, two settle, and two wild. As you are deciding on a path through the game, taking steps to get dice the follow your strategy are key to your success. Between trying to balance your actions and trying to decipher what your opponents will be doing, Roll is an intriguing challenge every time you play it. Die Brugen von Burgund (I’ve always wanted to write that), better known as The Castles of Burgundy, is a game where players are collecting and placing tiles to develop a city. Players create buildings of six types, each of which provides a unique special ability for that turn. Each turn of the game, players roll two dice to determine the actions they can take. The first action players can take is to use a die to move a tile from the game board to their holding area. The game board has six spaces, numbered 1-6, which correspond to what number die must be used to take the tile. The second action players can take is moving a tile from their holding area to their player board. Each space on the player board has two pieces of information: the type of tile that can be laid there indicated by the color of the space, and the number die needed to place the tile in that spot. The third and final action a player can take is spending a die to get two workers which can be used on future turns to add or subtract one from a die. The Castles of Burgundy is a masterpiece of design; Meeple Mountain writer David McMillan listed it as one of his Top 6 Euro Games. It may be one of mine as well. What makes CoB special is you’re given a breadth of actions to take and you are rarely in a pinch needing to do a particular action that turn. CoB is easy going while giving you lots of opportunities to expand your reach. Though the dice add randomness to the game, they’re never a source of pain. The ability to trade a die for two workers is always a valuable option since it opens up future possibilities. 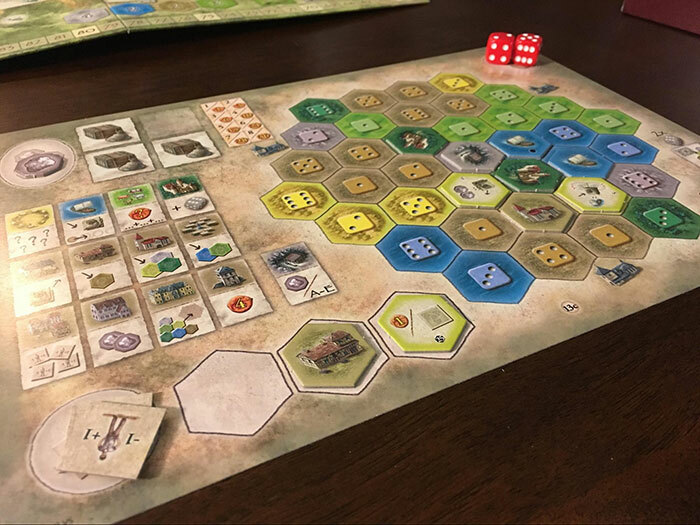 Read our review of The Castles of Burgundy. Some games innovate, bringing in new mechanisms or combining old favorites in new and interesting ways. 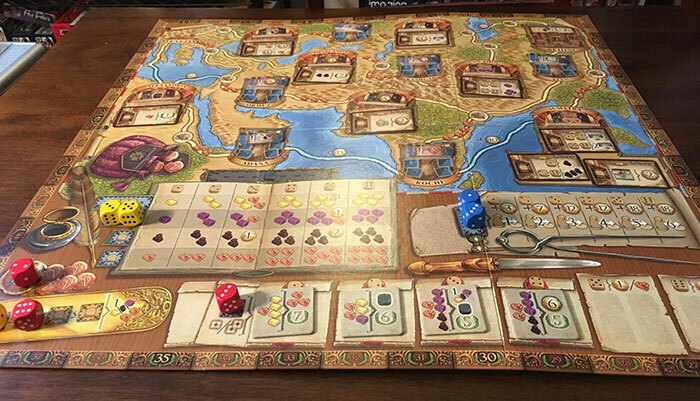 The Voyages of Marco Polo doesn’t come close to doing this, instead it combines mechanisms perfectly, integrating point-to-point movement, variable player powers (each of which is game-breakingly awesome), set collection, and card drafting. These mechanisms are all joined underneath the umbrella of dice worker placement, where you can improve dice rolls, or in many cases you may even want low numbers! Your dice are used to acquire resources, move across the map, gain money, and grab more contracts. As you do each of these things, you make it more expensive for your opponents to follow your actions. Resources are tight, so you constantly need to have an idea of what your opponents are doing while you’re considering your actions. 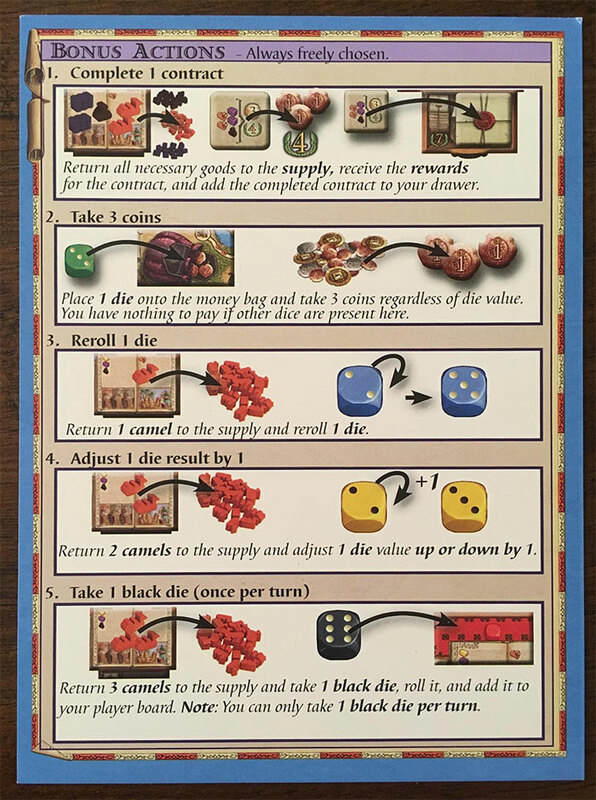 Marco Polo gives players several ways (shown next to here) to mitigate die rolls, from re-rolling dice, to acquiring more dice. One of my favorite mechanisms in the game is the movement. In order to move, you need to place two dice on the movement space. You can then move spaces up to the number of pips on the lower numbered die, paying the associated costs. After you move, you can build a trading house, gain resources if you’re first at that location, and unlock new actions. This ability to unlock actions can create masterful combos as you soar across the board. What makes Marco Polo a special game is that the mechanisms are so tightly joined together around dice worker placement. It’s an incredibly satisfying feeling to discover a path through the game where you use your dice productively. The game also provides enough ways to improve your die rolls that you never feel at a loss or that the dice are hindering your progress. AUTHOR’S NOTE: In between the time of writing this and publishing it, I played Marco Polo again and I moved it ahead of Castles of Burgundy. Both are great games, but Marco Polo just uses dice in more interesting ways. Troyes is a dice action selection game, where players roll dice of three colors and use these dice for a variety of different types of actions. Though higher numbers are generally better, players have several ways to mitigate bad rolls by re-rolling dice, flipping dice to their alternate side, using them to get more dice on later turns, and buying dice from other players. What makes Troyes special is there are numerous paths which you can follow. Dice are the perfect mechanism to open the door to the variety of paths. 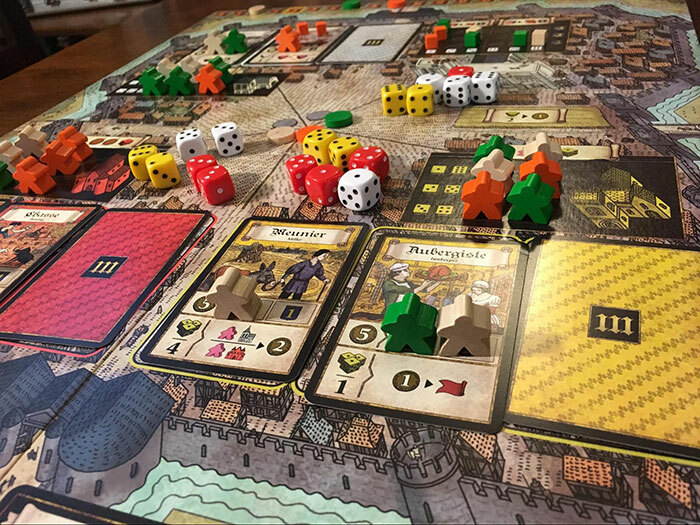 Check out our full review of Troyes. Dice have been a part of games dating back to the earliest games. Whether you like chucking a fistful of dice to resolve a battle in Twilight Imperium III, or you prefer letting dice specify which actions you can take in Castles of Burgundy, there’s no wrong way to use dice in board games (except roll to move, I’m looking at you Monopoly). What are your favorite euros with dice? Did we miss any of your favorites? Tell us in the comments! What do you think about Top 6 Euros Games with Dice? Give us your opinions in the comments below!